This Learn German BLOG** takes regular little snippets, tips and quips, of useful and interesting German learning bits and pieces. I post stuff on the site whenever and wherever things pop up.... Things that will be of interest to learners of German language and culture. If you have any tidbits to contribute do contact us via the Learn German Blog contact us form below. 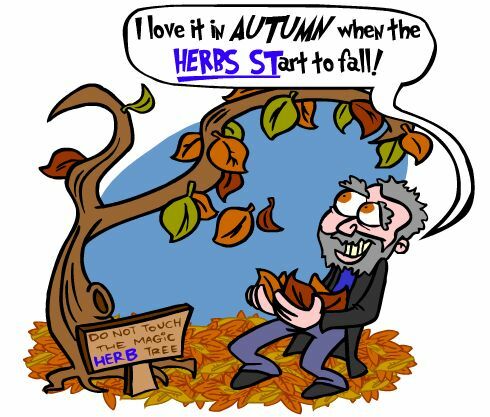 Imagine that in autumn the jazz musician HERB Alpert (m) likes to watch the HERBS STart to fall. Imagine the huge APPETITE of Emmanuel PETIT (m), eating from a bag in the German colours - yellow, red and black. Man ist was man isst. = You are what you eat. Note the clever word play: In German isst (he/she/it eats) and ist (he/she/it is) are pronounced the same. So, upon hearing, it could also be translated as: You are what you are! Der Appetit kommt beim Essen. = Just do it! lit. Appetite comes from eating... You will be encouraged once you start doing it. Imagine spending SUMMER under an umbrella in the German colours - yellow, red and black - on the beach is Gordon Sumner (m). Remember the picture, remember the word - male character indicates this noun is masculine. The German colours help you remember this word is very similiar to the English word. "Nennst du mich Goethe, nenn ich dich Schiller!" "You call me Goethe, and I'll call you Schiller" ... is a German saying meaning - you pay me a compliment and I will do the same. Schiller was a German poet, historian, philosopher who was friends with writer and man of letters Goethe. They collaborated on various works in the late 1700's to early 1800's. Nouns with Feminine Gender generally follow several patterns, as outlined here, though it is always best to learn the gender of nouns at the same time as the word itself. Click to read Feminine Gender. A useful list that helps identify groups of nouns with masculine gender. Of course there are always exceptions. The 200 Words a Day! language learning system helps to further reinforce the gender of a noun at the same time as learning the word. Click to read Masculine Gender. Did you know the Mercedes brand was named after someone's daughter? Practise your German now by reading about the world famous Mercedes car. A short German lesson with text written by a native German, is followed by its English translation, and a vocabulary list. Click to read Mercedes - die Marke. In German, Sie is the formal way of saying you, both singular and plural, to a person (or persons) who is a stranger, superior, elder, casual acquaintance or a business associate. These are formal, business relationships. It is used to show respect, and also non-physical distance from another person. Sie (you, formal) is always written in capital letters. Note: The German pronoun sie without capitals = they. Du is the singular you form used when addressing family, children and young people, friends, colleagues and animals. These are personal relationships. Ihr is the plural you form used when addressing family, children and young people, friends, colleagues and animals. Du / Ihr are always written with a capital in letters. Note: The German possessive pronoun ihr without capitals = her, its, their. Du is used when addressing God. You should wait for the other person to invite you to use Du with them, as a sign of a transition to a more personal kind of relationship, when they feel it is appropriate. This is called duzen – lit. to become Du – to communicate with more familiarity. Using Du to address someone older or less-known without their permission, is deemed rude and inappropriate. These days young German people do tend to be less formal and use Du terms on first meeting with strangers of a similar age. The swallow migrates north from Africa, so its appearance is considered to herald the beginning of summer in Europe. Just because one swallow appears however, does not necessarily mean the summer season has arrived. The proverb is taken from an Aesop fable "The Spendthrift and the Swallow", which tells the story of a spendthrift young man who has wasted away his fortune. When he sees the first swallow, he sells the coat off his back thinking he wouldn't need it as summer had arrived. A cold snap follows, and he is freezing cold. When he finds the swallow frozen to death, he blames it for arriving too early and for his own demise. Moral: Show a little patience, don't rush ahead into things. / A sign is not necessarily proof - do not rejoice too soon. "eine Schwalbe machen" (slang) = lit. "to make like a swallow" - to take a dive, to fall on purpose, eg. a footballer diving to gain a free kick! Wie ist das Wetter? = What is the weather like? Wie ist das Wetter in Berlin? = What is the weather like in Berlin? Wie war das Wetter in Berlin? = What was the weather like in Berlin? Wie wird das Wetter in Berlin sein? = What will the weather be like in Berlin? Das Wetter ist herrlich! = The weather is glorious! Das Wetter war herrlich! = The weather was glorious!. Das Wetter wird herrlich sein. = The weather will be glorious! Das Wetter ist schön. = The weather is nice. Das Wetter war schön. = The weather was nice. Das Wetter wird schön sein. = The weather will be nice. Es ist besser als Zuhause. = It is better than at home. Es war besser als Zuhause. = It was better than at home. Es wird besser als Zuhause sein. = It will be better than at home. Das Wetter ist wechselhaft. = The weather is changeable. Das Wetter war wechselhaft. = The weather was changeable. Das Wetter wird wechselhaft sein. = The weather will be changeable. Das Wetter ist kühl. = The weather is cool. Das Wetter war kühl. = The weather was cool. Das Wetter wird kühl sein. = The weather will be cool. Das Wetter ist schlecht. = The weather is bad. Das Wetter war schlecht. = The weather was bad. Das Wetter wird schlecht sein. = The weather will be bad. Entschuldigen Sie (bitte)! = Excuse me (please)! Sorry! Oh sorry! I'm so sorry!Pardon/I beg your pardon! (sich) entschuldigen (v) = to say sorry; to excuse (oneself); to pardon. die Entschuldigung (f) = excuse, apology. Ich bitte um Entschuldigung. = I do apologise. entschuldigend (adj/adv) = apologetic / apologetically. Verzeihung! = Sorry!, I’m sorry! Es tut mir leid. = I’m sorry. Das tut mir alles schrecklich leid.= I’m so sorry for everything. Es tat mir leid. = I was sorry. Es tat uns leid das zu hören. = We were sorry to hear that. Wie heisst Du? = What's your name? Ich heiße Cornelia. = My name is Cornelia. Woher kommst Du? = Where are you from? Ich komme aus Hannover. = I come from Hannover. Wo wohnst Du? = Where do you live? Ich wohne hier in Stuttgart. = I live here in Stuttgart. Wie alt bist Du? = How old are you? Ich bin zweiundzwanzig Jahre alt. = I am twenty-two years old. Kennst Du meine Freundin? = Do you know my friend (f) / girlfriend? Nein, es freut mich. = No, pleasure to meet you. Wie heissen Sie? = What's your name? Woher kommen Sie? = Where are you from? Wo wohnen Sie? = Where do you live? Wie alt sind Sie? = How old are you? Kennen Sie meine Freundin? = Do you know my friend (f) / girlfriend? Check out the webpage of learning German verbs. Some handy hints in this overview of the structure of German verbs and verb construction. "Was ist das deutsche Wort für ....?" "What's the word in German for ....?" "Wie sagt man .... auf deutsch?" = "How does one say .... in German?" "Was ist das deutsche Wort für 'hedgehog'?" "What's the word in German for 'hedgehog'?" Das deutsche Wort für 'hedgehog' ist 'der Igel'. The word in German for hedgehog is 'der Igel'. Aber gern! = But of course! Gern geschehen! = You're welcome! / Don't mention it! / It's my pleasure! Ich studiere gern. = I like studying. Ich gehe sehr gern ins Kino. = I love going to the movies. Ich mag ihn so gern! = I really fancy him! When are the STAT FINDINGS taking place? STATTFINDEN is a commonly used verb meaning to 'take place' or 'to happen'. Sounds like STAT FINDING, as in finding statistics. When will the event happen, or take place? German colloquialism for brand spanking new! Here's a good one that my German friend from Cologne used yesterday. nigel nagelneu! = Brand spanking new! Der Nagel is the German word for nail. We and they BITE BISON! One of the good things about the German present tense, is that it has only one simple form. Imagine that we and they bite BISON! Genders are so important in German, not solely for getting the masculine, feminine and neuter articles in the right place, and not calling a he a 'she', or a she an 'it'. The German cases are all based on gender too. Cases are the way the articles (e.g the word the) change depending on what happens during an action. I shall write more on that soon. But the moral of the story is - you must learn your genders to enable you to learn your cases. If you don't, then you will be forever in a tangle. Check out the little Memory Trigger© for the German word for 'journey'. Here we have Condoleeza RICE to help you remember the word, and remember the gender of it. And we add a bunch of other words that are related to die REISE. Check out the Memory Trigger for 'journey' in German. **blog is short for weblog, and is a short, newsy, info update on a website, like a diary. So it is like a 'what's new' on any topic. Learn German Blog - regular quips and tips for learners of German language. Transcity Properties Ltd, 32 Alverton, Great Linford, Milton Keynes, Buckinghamshire, MK14 5EF, United Kingdom© 2012 - Learn German Blog.